Labelexpo Americas is the prime opportunity to witness the new face of Mark Andy and truly understand our commitment to the converter. Formerly a company maintaining an OEM-centric business model, the organization has more than doubled its supply and service operations and expanded workflow offerings in recent years. Six new innovations never before seen by the Labelexpo Americas audience will be unveiled and eight technologies are slated to be demonstrated during the three day event in stand 319. The Performance Series press line is a Labelexpo veteran. However, this year’s show brings a new model- the P7E. The P7E was recently launched and brings key advancements that promote operator efficiencies and enhanced automation through Mark Andy AI. The P7E is also joined by the new P5E and P9E models. The P9E is catered to those interested in going wider and taking all competencies of the P5E and P7E into film and flexible packaging. An interactive P9E module will be on display for those looking to learn more about the wider platform and new print station loading mechanisms. In addition to new features, the P7E will be outfitted with Digital Plus Screen, a rail mounted UV inkjet retrofit. The modular hybrid solution is a digital replacement for rotary screen and delivers a scalable ink pile height for tactile effects. The unit can be incorporated into new press builds and is retrofittable on any flexo press. Making its’ first formal trade show debut since the March product launch is Digital Series HD. 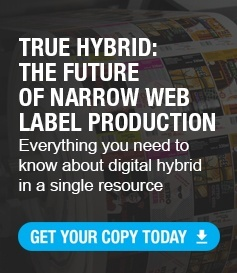 The True Hybrid runs 240 fpm at all colors (CMYK+OGV) with a visible print quality of 1200 dpi. Standard to all larger Mark Andy presses, Digital Series HD is configurable in the form of digital colors, converting preferences, VDP packages and inline flexo options. Digital One will accompany the Performance Series P7E and Digital Series HD, having proven to be a show-stopper for businesses looking to enter into digital label printing. Since launch in 2016, the machine has been integrated in converter shops worldwide to support micro and short run digital work. Show models of the production-class pieces of equipment will be configured with Praxair anilox rolls and all plates will be mounted using tesa Softprint® Secure tapes, which are available for purchase through Mark Andy Print Products. The Performance Series P7E will be running Siegwerk's 'Sicura LEDtec' Dual Cure UV LED ink system. Siegwerk's market leading LED ink system provides high quality, fast curing, vibrance and durability, pairing well with the performance of Mark Andy ProLED. Standard to all Labelexpo events, Rotoflex will share space in the Mark Andy Inc. booth. The company will ship 3 technologies from its Canadian headquarters: the VLI, DSI and a new offline finishing and embellishment engine. Representatives from Mark Andy Print Products will be on-stand 319 as well as in stand 749 with partners at DuPont Advanced Printing. This consolidation of show presence between the two brands comes in the wake of Mark Andy being named the exclusive distributor of DuPont™ Cyrel® products in North America. New innovations, high-end applications and an enhanced hospitality experience make stand 319 a must visit location during this year’s show. If interested in scheduling an on-stand consultation with Mark Andy, please follow the link. Chandler Davis is a Senior Marketing Specialist at Mark Andy. She is a University of Missouri graduate with a passion for social media, packaging design, and all things printing. You can also find Chandler on LinkedIn.